Should advertising for unhealthy products be banned on TV? Whether we should ban on advertising unhealthy products on televisions is a matter of no inconsiderable concern. In this writer’s opinion , despite some limited objections in this policy, it will bring far more good than harm. It is of tremendous importance to understand unhealthy products such as tobacco , cigarette , liquor or fast food … seriously do harm to people’s health. As a result a ban on these products’ advertisements is one of the best ways by which we can made unhealthy products become less popular among people . There will be a lower number of people wasting their money on products killing their lives .This policy leads to better societies , where there are healthier people not suffering from diseases because of using unhealthy products . Moreover, these advertisements badly influence youngsters. Due to the fact that people at that ages are very curious , they will demand products after watching its’ colorful advertisements even though these products are addictive such as tobacco or wine… . Just as youngsters are not old enough to know what is bad for their health, so too are they endangered when they are watching bad products’ advertisements. As we can see, it is more needs to be done to promote a ban on these advertisements as it will deter our children from being affected by them. There is ,however another perspective namely that this policy will affect the freedom of business . People can sale and advertise any legal products if they want . Furthermore, there is no case to be made that watching some unhealthy products ‘ advertisements can make people want to use them or affect their health . One more reason for people , who don’t advocate this policy is that unhealthy products manufacture creates many jobs for many people and bring in a huge amount of tax for governments . Banning this multi-billion industry from advertising its ‘ products will seriously affect it. To recapitulate, Although there are some limitations in this policy , it is much to talk about its benefits. 1.Whether we should ban on advertising unhealthy products on televisions is a matter of no inconsiderable concern. 2.is a matter of no inconsiderable concern.....hmmmm...i dont think so ...scrap the hackneyed phrase. 2. In this writer’s opinion , despite some limited objections in this policy(?? ), it will bring far more good than harm. 6.This policy(where is the policy?) leads to better societies , where there are healthier people not suffering from diseases because of using unhealthy products . 13.One more reason for people , who don’t advocate this policy(there you go..) is that unhealthy products manufacture creates many jobs for many people and bring in a huge amount of tax for governments . Banning this multi-billion industry from advertising its ‘ products will seriously affect it. In summary , you need to restructure your essay ,clarify your ideas and formalize your writing. first , is a matter of no inconsiderable concern , means this matter is concerned alot , but just a different way of telling that, you will get a higher rate in ielts task from examiners by using this . second, in this writer's opinion , that's the way every one use in ielts task 2 to refer to in my opinion , it is a more polite way . third It is of tremendous importance , ? what's wrong with this man ? that means its is very important to understand ? . Hi Nhattrungluu and welcome to Writefix! Nhattrungluu, have a look around the site and you will see the same theme coming up again and again: it’s time to let go of those crutches and tired old phases. It is incorrect to say that including phrases like “a matter of no inconsiderable concern” or “It is of tremendous importance" will by themselves get you a higher mark. Instead of relying on myths and the half-baked ideas of uninformed commentators, let’s have a look at the official descriptors for IELTS Task 2 Writing (public version) here. Under Lexical Resource, a candidate at Band 7 uses “less common lexical items.” Fine! "A matter of no inconsiderable concern” is a less common lexical item (unless 1.5 million IELTS students add it to their essays to get higher marks). We now have a problem. An ‘awareness of style’ means that you choose the right style for the occasion. You don’t use informal words like ‘dude’ or ‘guy’, but equally you don’t need to use extremely formal words like ‘recapitulate’ or ‘of tremendous importance’ or ‘limited objections to this policy.’ These words are suitable for long formal reports or editorials in the Times of India, but are overkill in a short IELTS essay. Task 2 Writing task is supposed to be a short 250-300 opinion or argument essay (not 345-word, as in this case), with examples from your own knowledge and experience. It’s not a term paper, a United Nations treaty, or a debate by Oxford academics. And the word ‘collocation’ means the unusual or low-frequency words are used properly with other words - located correctly together. There is no point in using words or phrases like ‘recapitulate’ or ‘no inconsiderable concern’ or ‘there is no case to be made’ when the same or adjoining sentences have basic errors in agreement, in punctuation and pronoun reference - or even vocabulary choice. So even if adding some unusual or complicated phrases moved you up a band for vocabulary, you can still be dragged down by grammar, task response and coherence. So my advice is write using your own fresh, simple English, and avoid using the tired old phrases you can find here or here. I will try to post later regarding specific errors in the essay. Can I just ask that before you post your next essay you run it through one or both of the two readability links at the top of this page - this one at read-able.com, or this one at online-utility.org. Shorten sentences longer than 20 words. Aim for an average of 12-15 words. In Microsoft Word, check for punctuation. Leave one space AFTER each comma or full stop, and nothing before it. Add 'and' or 'or' between the last two items in an list. "It's" means "it is" - it's raining, it's late, it's really annoying, or even It's a matter of considerable importance. It would be great if you could look at some essays by other users and make some comments. Look for recent essays with only 1 or 2 posts, make some comments, and help other people to get great scores! 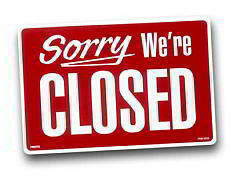 Sorry for not being able to get back to you yesterday. Here are a few comments. Well, more than a few! Punctuation is important in IELTS. If you good writing ability and vocabulary, you don’t want to lose marks because of simple punctuation errors. Have a look at the official descriptors for IELTS Task 2 Writing (public version) here, under Grammar and Accuracy. In Band 4, punctuation is ‘often faulty’; in Band 5, it can be ‘faulty’; and in Band 6, the writer can have ‘some errors in grammar and punctuation’ as long as they ‘do not impede communication.’ Band 7 allows only ‘a few errors’ in grammar and punctuation. Punctuation is the easiest thing to fix, so you can tidy up this area very quickly. Due to the fact that people at that ages are very curious , they will demand products after watching its’ colorful advertisements even though these products are addictive such as tobacco or wine… . Just use sentences. There’s no need to dots to show that your ideas are hanging on or trailing off. See here for more: http://grammar.quickanddirtytips.com/ellipsis.aspx. Another point here about supporting ideas and coherence/cohesion is that children probably don’t know that wine or cigarettes are addictive. Your idea is not well supported: Most beer companies or cigarette manufacturers don’t target children directly in their ads, although I suppose it’s always good to be vigilant in case Pampers and Johnny Walker decide to cut costs and cooperate. Children are very curious and may demand products after watching colorful or attractive advertisements. (12 words). Manufacturers of sweets, soft drinks and fast foods know this well and target children specifically in their advertising. There is ,however another perspective namely that this policy will affect the freedom of business . There is, however, another perspective; namely, that this policy will affect the freedom of business. I would suggest using simpler structures and getting them right. Just as youngsters are not old enough to know what is bad for their health, so too are they endangered when they are watching bad products’ advertisements. It’s a nice structure and you’ve used it correctly. Well done! But the sentence is spoiled by the very weak word choice of ‘bad’ products. The topic or central idea of your Paragraph Two is that banning ads will reduce lead to a healthier society. Your topic sentence (the first sentence in your paragraph) should say this. A ban on advertising would lead to a healthier society. It’s a short, simple sentence which summarizes the paragraph. You can still use your current first sentence, but just move it further into the paragraph. In your introduction, you use ‘should’ and ‘will.’ In paragraph two you use ‘can’ and ‘will.’ Try to be consistent. The idea of banning unhealthy advertising here is a hypothetical or imaginary idea, so it’s probably better to use ‘would’ or ‘should’ and conditionals (‘If a ban is/were introduced, it would…’). There is ,however another perspective namely that this policy will affect the freedom of business . People can sale and advertise any legal products if they want . In this writer’s opinion , despite some limited objections in this policy, it will bring far more good than harm. Despite possible objections over free markets and freedom of choice, I believe a ban on advertising healthy food would lead to a healthier society. In conclusion, despite opposition from manufacturers and a possible loss in revenue for governments, there would be huge benefits from a healthier society and a better diet. Your conclusion should summarize the points you made in your essay. You have made a lot of points - now is the time to summarize them. You can read more about conclusions here. In many countries laws forbid advertisements for smoking on TV. Some people propose extending this measure on other harmful products like alcohol or fast food. A ban might be an effective way to protect people‘s health but may conflict with other interests. Supporters of allowing commercials for unhealthy foods want to limit the government‘s influence on consumer‘s choices. In their view individuals should have the freedom to make their own choices whether to buy a product. Also, businesses should be free to trade these products within the legal restrictions. It is argued that more government regulations would hurt some businesses and patronize consumers. In fact, it is rather hard to explain why something that is considered addictive or highly unhealthy can be sold but advertisements featuring it should be restricted. Opponents of showing advertisements on TV can refer to convincing reasons for their position. Banning smoking ads and making it less socially acceptable to smoke seems to have been more effective against smoking than health education. In particular, the hope is that these measure can help to protect teenagers and children from developing unhealthy habits in first place. If young people see less pictures of people drinking or smoking on TV they are also less likely to assume it is normal behaviour. Lastly, the government has to deal with the consequenence of the consume of harmful products on people‘s health. Their impact on health care cost can be significant. Therefore, far-reaching preventative measures, like a ban on commercials, are fully justify. In conclusion, there are convincing arguments for allowing commercials even for unhealthy products. On the other hand, their ban would likely have desirable effects on lowering the consumption of products that affect health negatively. Thanks for this. As usual, a clear and well-developed essay. A ban might be an effective way to protect people‘s health but may conflict with other interests. The first part of your sentence tells the reader that there will be a paragraph about the benefits of a ban and the second part suggests that you will discuss some problems with such a ban. Supporters of allowing commercials for unhealthy foods want to limit the government‘s influence on consumer‘s choices. Many people oppose restrictions on food advertising and reject interference with consumer choice. am i missing somehting? Incorrect tool? Numbers like this dont tell me much... What should tehy be? I think you were using the readability tool at online-utility.org, while I was using the one with the pretty color bars at http://www.read-able.com. 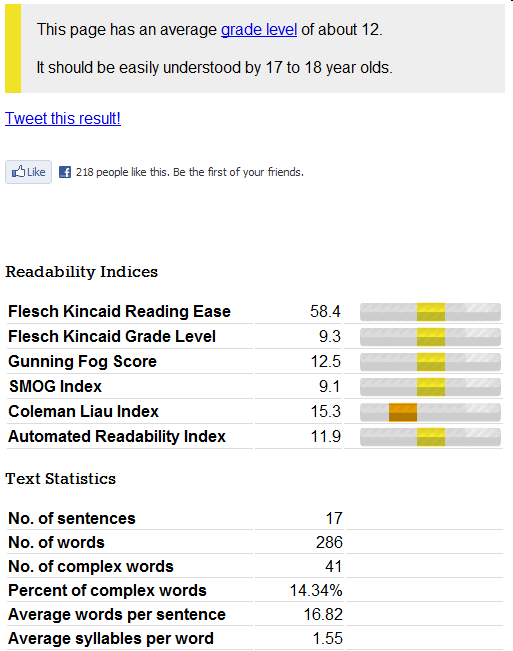 Both are very useful, and so is Microsoft Word's built-in readability analysis. If you don't know how to turn it on, just read here: How to check your work in Microsoft Word. What do the indexes mean? Most of the readability indexes (Coleman-Liau,Flesch Kincaid, Gunning Fog, etc - there are many) do not 'read' your essay - they don't understand English. All they do is a calculation based on the number of words, sentences, or word length. Many of them give a number which is the years of school needed for a native speaker of English in the US to 'understand' your essay - a grade level of 12 means that a person should have completed secondary school or high school to be able to 'read' your essay. For these, for our purposes here with IELTS essays, the lower - the simpler, the easier - the better! The readability indexes are like a thermometer which just gives you a number. It can be in Centigrade or Fahrenheit, but it's just a number. A nurse can use a thermometer take your temperature, but a high or low number doesn't say what's wrong with the person, and a readability index doesn't always say what's wrong with the essay. Both thermometers and readability indexes can be fooled. In my experience, they are reasonably accurate and helpful. If someone is using too many long sentences, or not enough paragraphs, or too many passives, or too many complicated words, the indexes will show me quickly. By adding a few full stops, removing commas, adding a couple of short sentences, removing passives, and simplifying vocabulary (e.g. using the 3-syllable word 'conclusion' instead of the five-syllable word 'recapitulate') most people's essays will be shorter, simpler, easier to read - and get a higher score in IELTS. Here's your essay about TV ads for unhealthy food from read-able.com. If you go there and copy-and-paste your essay, you will see the explanation for different readability indexes as well. Your essay is nice and consistent. Experiment by breaking up some of the longer sentences, adding some short ones and see if you get some green bars! 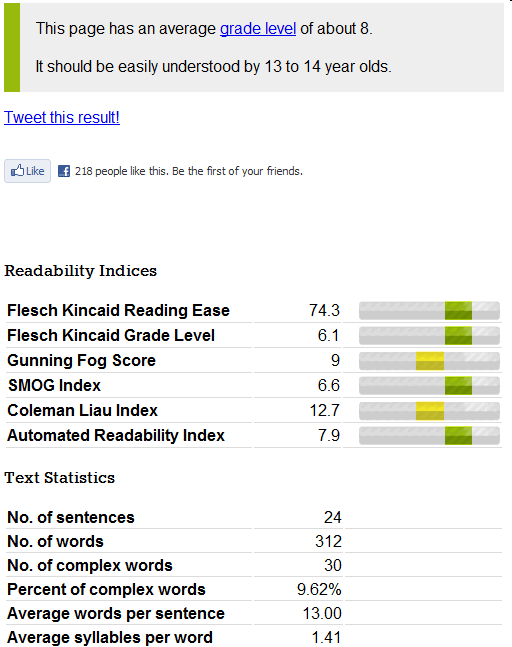 I suggested playing with the readability index at read-able.com and seeing how to get those nice green bars. Here's an example. I took your essay above and shortened a few long words (e.g. 'ads' instead of 'advertisements' and 'huge' instead of 'significant'). Here's your new essay! Lots of beautiful green bars showing that your essay not only sounds better when sung by Frank Sinatra, but is easier to read as well! (Of course, it's now meaningless! Download a PDF with revised 'Sinatraized' version here. (Right-click, save to your computer).